The Curly-Coated Retriever is considered to be one of the oldest of all retriever breeds. They have been retrieving as far back as the eighteenth century in England. Their development shows that they descended from now-extinct English Water Spaniels and retrieving Setters with a touch of other retriever-type dogs, including Poodles which, essentially, are retrievers themselves. Whatever their makeup and breeding background they first made their appearance in the show ring in England in 1860, and thought to have been the first dog used for serious retrieving. Especially prized by gamekeepers, who appreciated their hunting ability, courage, and perseverance ~ the Curly's popularity waned as the Labrador Retriever took over in popularity amongst hunters. The War years added to their demise. After World War I, in 1919, only five Curly-Coated Retrievers were still registered. Slowly the breed began to recover but with the onset of World War II once again almost died out. Curly-Coated Retrievers were first brought to the United States in 1907, and the first one ever registered with the American Kennel Club was a dog named "Knysna Conjurer" back in 1924. The breed saw a resurgence in the United States in the late 1960s when many Curly-Coated Retrievers were imported from England, Australia, and New Zealand. Today the Curly-Coated Retriever is beloved by many, especially on the East Coast of the USA. Determined, this breed is a great "Retriever" with lots of drive. Require lots of exercise, this is not a 'lap dog' that prefers to lay around all day. Great with older children ~ who can handle their size and not get 'knocked over' by their rambunctious puppy playfulness. Are good with other dogs and pets. Curly-Coated Retrievers take slightly longer to mature than other breeds ~ which tells you that they hold onto their 'puppy personalities' longer than most. Too cute! Easy and responsive to training, keep them busy, as boredom can have them 'tuning out' on you. Mix up the training, as repetitive exercises soon bore them. Noted for their good health in general, but some have developed hip & elbow dysplasia. 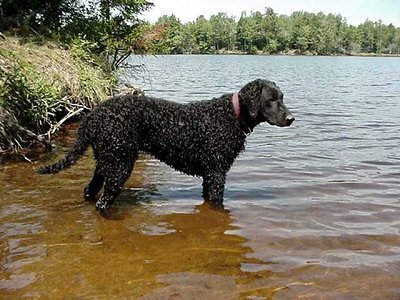 The Curly-Coated Retriever is a very happy, energetic, and easy going breed. They are highly intelligent and very eager to please. They are historically hunting and gun dogs which makes them very easily trainable. However, one thing to be aware of with the Curly-Coated Retriever is that they are late bloomers. They typically do not fully mature until they are about three years of age. The owners should be patient and understand before they get the puppy that they will have a puppy for a few years. Curlies make excellent family dogs. They are extremely loyal and desire close family contact. They show tons of affection and are very loving. They are said to be great therapy dogs. Their happy go lucky nature make them excellent animals to have if there are children in the house. Owners with children should be cautious and supervise the dog with the children because the dogs can accidentally knock the children over. The same applies for the elderly. In their first few years of maturation the puppies are very rowdy and jumpy and if there is concern about children or elderly being jumped on or knocked over it is suggested that perhaps the Curly-Coated Retriever should not be in those households. They make excellent watchdogs and will protect the family from danger or threats. The Curly-Coated Retriever does need to be socialized and trained from a young age. They are sensitive dogs and can be very reserved and timid around strangers. Socialization at an early age can eliminate or reduce this shyness so that it does not become problematic. Due to their nature as watchdogs and their desire to protect the family, it is important that they are socialized at a young age so they know the difference between threats and daily happenings. They are also very mischievous and can have a mind of their own. This makes it important to have early, gentle, and consistent training. The training should be gentle, as this breed is rather sensitive, but it should also be firm to show the dog who is the dominant one in the relationship. The Curly-Coated Retriever is the perfect dog for a family or individual who lives an active life style, preferably close to the water. They should also be capable of consistent and firm training. The dog's independent thinking can make training difficult so an experienced dog owner is recommended. The owner should be patient and firm with the animal from the time they are a puppy and as they mature in the next few years. The Curly-Coated Retriever is definitely not a dog for everyone, but will make excellent pets and companions for the right individual or family. Grooming of the Curly-Coated Retriever is considered to be a minimally time consuming process. Hunters that have Curlies often do not bathe or brush their dogs during the hunting season because it can help protect them from the brush and rough environments. The Curly-Coated Retriever has a very high energy level and craves physical and mental stimulation. They are a perfect dog for an active individual or family. They love to swim and water retrieve. This makes them excellent dogs for the family who goes to the lake or lives near the water. They should be exercised daily. They do love the outdoors and enjoy any type of physical activity, but really do prefer to be retrieving and in the water. They are highly intelligent and energetic which makes them the perfect dog for agility and obedience classes. Agility training and competitive obedience are excellent ways for the Curly-Coated Retriever to obtain both that physical and mental stimulation that they crave. If the dog is being used for hunting or water retrieving it is important for the owner to take some care in ensuring that the dog is clean from debris and any injuries. Proper training of the Curly-Coated Retriever is essential. They can be difficult puppies and dogs and therefore should be trained from an early age. Initially it is important for the dog to be given enough mental and physical stimulation. They are known to get bored and become destructive. As puppies they are late bloomers and therefore the owner should be aware that they could have rowdiness and other issues on their hands for up to three years. They can destructively chew things and can make a total disaster out of the house and yard. They are also known to bark excessively when bored. This high energy dog should be watched carefully around young children and the elderly to make sure that no one gets hurt. In addition to this, as puppies they can be very mouthy and will carry objects around the home and mouth people's hands and feet. Socialization is also very important for the Curly-Coated Retriever. Curly-Coated Retrievers can be very standoffish with strangers and therefore should be put into new environments and around new people from a young age. They can be quite stubborn which means that training should be firm and consistent. The handler or owner should be aware that they need to prove to the dog and establish that they have the upper hand in the relationship. They are highly intelligent and are trainable dogs for agility and obedience, but it does take a firm hand.